JAINA is the only national organization representing all the Jains in North America irrespective of their languages, regions and traditions. It has provided a forum to foster friendship and unity among all Jains of North America and encourages our future generations to practice and live a Jain Way of Life. JAINA was established in 1981 and has since grown from its initial membership of four Jain centers to sixty seven Jain centers and through its many committees and projects impacts over 125,000 Jains across North America. Your generous tax deductible donation of only $251 or more will enable JAINA to support and carry out many of the charitable and educational projects listed below. 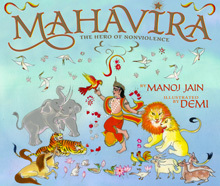 Your donation is tax deductible and all donors will receive a complimentary copy of Mahavira - The Hero of Nonviolence, a beautiful 2014 award winning USA religious illustrated children's book on our 24th Thirthankar, along with a copy of the 2015 JAINA Calendar to gift to family or friends. As you can see below JAINA has many charitable activities and programs it is undertaking to keep our Jain culture and heritage live in North America as well as promote a Jain Way of Life for our present and future generation. A generous donation of $251 or more will support many of these wonderful causes and projects and are a small investment in our future. Please take a few minutes to click on the link below and donate generously. JAINA’s Innovative Projects in North America – for your Family and your Sangh! 1. What is JAINA's Vision? JAINA's mission is to preserve and share our Jain Religion and Way of Life and have a vibrant Jain community in North America. 2. Why Do We Need JAINA? There are over 70 Jain organizations - each locally focused. JAINA brings them together. We need a professional organization that can take on North America wide projects as well as strengthen our Dharma for our future generation; carry out nationwide projects; JAINA is that organization. 3. How Will I Know each Committee's / Project's Progress? On-line! Project plan, status, and progress as well as the content are on-line. You can view project progress at www.jaina.org any time. 4. Who Will Manage My Donations? The committees are managed by talented and highly accomplished individuals. Not only have these committee chairs excelled in their own professions, they have already demonstrated their leadership skills in the communities they live and the professions they practice. Donations received for targeted causes that are marked as such for specific committees are posted as such. Appropriate credits are assigned to the respective committees and these projects or initiatives are managed under the oversight of each respective committee chair. 5. JAINA has over 35 specialized working groups called JAINA Committees. 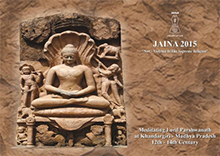 JAINA CALENDAR: The annual Calendar has elevated JAINA's image as an institution working to preserve and promote the Jain heritage and ancient culture in the Western world. Every year it Freely distributes over 15,000 copies of the Calendar to every Jain household in North America. Year 2015 Calendar will be in your mailbox by New Year’s. EDUCATION: Provides Jain religious education and educational materials to Jain children, youths, and adults by conducting classes, workshop, seminars, and lectures at various Jain centers in North America. The committee publishes the Jain Pathshala Books used at many of our local Jain Centers. 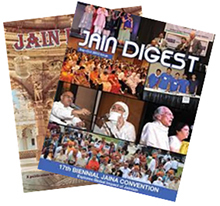 JAIN DIGEST:Is published quarterly and mailed to 15,000 Jain families in North America and worldwide. 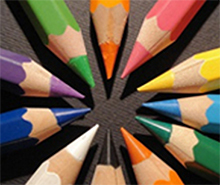 Jain Digest communicates the activities of JAINA and local Jain Centers across North America. It aims to put together in-depth articles of Jainism, spiritually related topics and events happening in our community. CONVENTION:Since 1981, JAINA Conventions have become a unique socio-religious event for the entire Jain community of North America. Our Jain Monks, Bhattaraks, Scholars, and Dignitaries from all over have graced these occasions. The upcoming 18th JAINA Convention will take place in July 2015 in Atlanta, GA - with the theme "Jainism: World of Non-violence”. Please join us in Atlanta, GA from July 2 - 5, 2015. 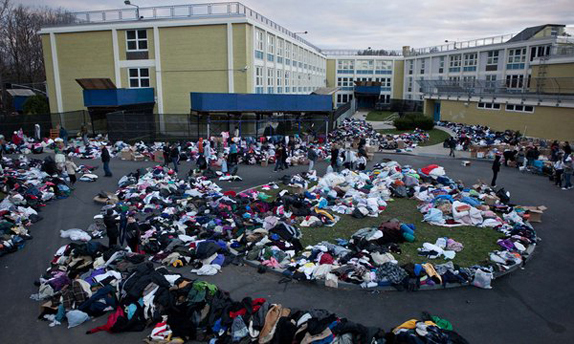 WORLD COMMUNITY SERVICES (WCS): To provide humanitarian services all around the world. WCS aims to provide medical services to disadvantaged and poor people while also being at the forefront of emergency situations such as earthquakes, famine, floods and hurricanes, among other scenarios. The WCS has helped over 65 Humanitarian Projects Worldwide. UPLIFTING UNDERPRIVILEGED JAINS: Assist economically challenged Jain families to come out of poverty through quality education, vocational and skill enhancement training leading to higher paying jobs. In 2013 - 2014, your generous support has made significant difference in management at schools affecting nearly 1,000 children. In addition over 110 students have directly benefited from this program. JIVDAYA: Following principle of 'Live & Let Live”, Non-violence & Ahimsa are promoted. From generous donations of fellow Jains, animals in various Panjarapoles in India and USA are provided with food, shelter, medical needs and thousands of animals are saved from slaughter houses. ACADEMIC SCHOLARSHIP: Provides support for any bright, hard-working, goal-oriented, practicing Jain youth in North America to be able to afford to attend an institution of higher learning. This committee has created the JAINA Academic Scholarship Program (JASP) which has provided numerous need-based scholarships for high school seniors in North America. YOUNG JAINS OF AMERICA (YJA): Started in 1991 with a mission to establish a network to share Jain heritage and religion through young people. Today YJA has grown into an organization representing over 2,500 Jain Youths nationwide from the age of 14 - 29. Under JAINA's guidance, YJA is dedicated towards educating the leaders of tomorrow. YOUNG JAINS PROFESSIONALS (YJP): Young Jain Professionals (YJP) is an organization focused on increasing awareness and understanding of Jain principles and heritage. The organization is mainly for young Jain professionals in the ages of 24 - 42. They focus primarily on Professional Development & Networking events, Spiritual development programming, and Community Service initiatives to promote Jain advancement. 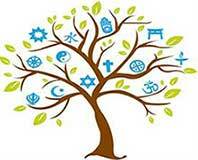 INTERFAITH: Participates on an international, national and on the local level with interfaith and multifaith organizations on a regular basis as well as on occasions like prayer services on Martin Luther King, Jr. Day, Thanksgiving Day, International Day of Peace and Human Rights Day. JAIN MILAN/ JNF: Jain Milan and Jain Network Forum is an opportunity for Jain youths (age 21 and older) throughout North America to make friends, to engage in networking, to develop business contacts and to possibly find a life partner. We hope to achieve our goal to preserve Jain traditions and values in our next generation and strengthen our community. In last ten years more than a thousand youths have participated. 6. What are other JAINA Projects? 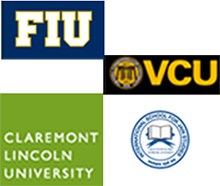 College and University-Based Centers for Jain Studies: A growing number of North American institutions that focus on the study of Jainism are offering open discourse and practical applications of Jain teachings in today's world. 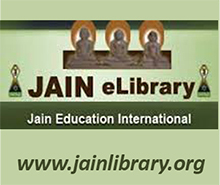 We help sponsors programs related to Jain Studies as well as coordinate activities with the university and the Jain Community to advance the teaching and awareness of Jainism. 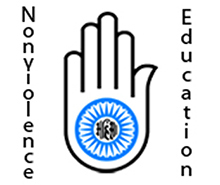 High School Teachers' Non-Violence Summer Immersion Program: This innovative program sends high school teachers to various parts of India where they practice Jain principles while exploring the benefits of living a non-violent lifestyle. This program also helps to spread the knowledge and understanding of Jainism when these teachers come back and teach their students in North America. 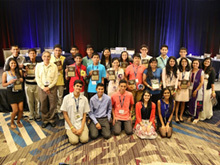 Jain Academic Bowl (JAB) Competitions: We have hosted JAB for JAINA and YJA Conventions. During the last YJA convention 50 youth participated in the program. During the previous JAINA Convention, 16 teams (80 youths) participated in the program. 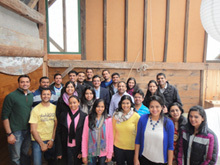 Jain Leadership Fellow Program: Offered to students interested in the advancement of Jain values in North America. 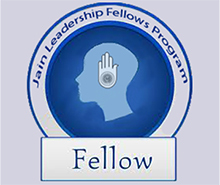 This fellowship will provide an opportunity for individuals to develop the leadership skills required to contribute lasting impacts on community building and social change that will impact the Jain Community. 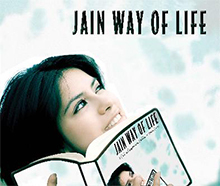 Jain Way of Life (JWOL) Book: JAINA will be revising Yogendra Jain's Jain Way of Life, a contemporary handbook of Jainism and its principles. This book explains the principles of Jainism and how one can practice them in the modern world in simple English. Purchase a copy today at jaina.org/jwolbook from our online bookstore. JAINA Internships: The JAINA Legislative Internship (JALI) in Washington D.C. builds leadership skills while collaborating with the American Jewish Committee to improve Jain-Jewish relations. This program provides valuable knowledge and skills to young Jains in public service and government. JAINA Management Office: To serve North American Jains better, JAINA is planning to have its own office facilities by 2020. A full-time manager, volunteers and interns are working hard to coordinate JAINA's committees and projects in order to make this happen. Mahavira: A Compassionate Hero Children's Book: Written by Dr. Manoj Jain and illustrated by world-renowned illustrator Demi. This JAINA sponsored book seeks to introduce young people to the story of Mahavir, the last of the 24 Tirthankaras noted for his teachings regarding non-violence, forgiveness, and compassion towards all living beings. Winner of 2014 USA Children’s Religious Best Book Award. Mangalam Jain Television: Creates high quality Jain Media programs. It showcases the Jain way of life and Jains of North America, with special platform given to our youths. Mangalam TV Show was launched over 7 years back and is broadcast on TV and available on the Internet. More than 15,000 people are watching the show from 51 countries around the world. Plant-Based Meal Initiative: The Healthy School Meals Act is designed to help schools offer healthy, plant-based vegetarian meals. A plant based diet is not only healthy, it is also a great way to reduce our environmental footprint. Learn more about JAINA's continued efforts to spread vegetarianism across the nation at jaina.org/healthymeals. As you can see JAINA has many charitable activities and programs it is undertaking to keep our Jain culture and heritage live in North America as well as promote a Jain Way of Life. I hope you can see that $251 tax deductible donation to support any of these wonderful causes and projects are a very small investment in our future. Please take a few minutes to click on the link below and generously donate. Make a Donation to Support these and many More Projects!